"Growing up near the Chesapeake Bay you learn that crabs are as valuable as gold. My mom made crab cakes every Friday in the summer months, but I like my recipe just a tad better. Don't tell mom." Pick the crab meat to remove any remaining pieces of shell. Pick bread into small pieces and place in medium-size bowl with crabmeat. 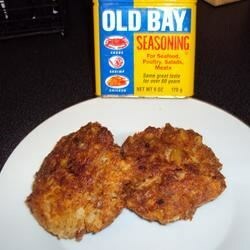 Add egg, mayonnaise, mustard, Worcestershire sauce, and Old Bay seasoning (tm). Mix ingredients by hand to avoid overworking the crabmeat, you want to keep the lumps of meat as much as possible. Form into patties; this should make 6 good-size cakes. Heat 2 tablespoons of butter in a skillet, then fry cakes for about 4 minutes each side or until brown crust forms on both sides of the crab cake. Delicious, homemade crab cakes that come together quickly.